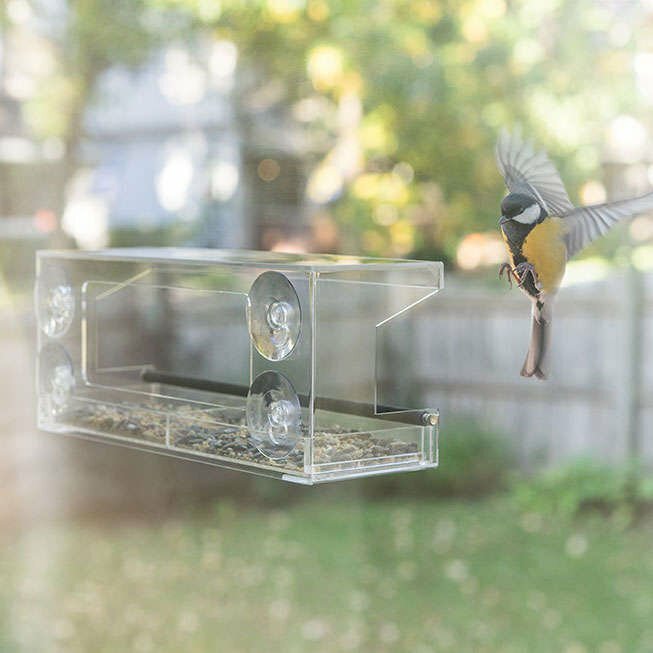 The Wildbirds of Joy Window Bird Feeder is the best way to enjoy watching birds without leaving your home or using binoculars. 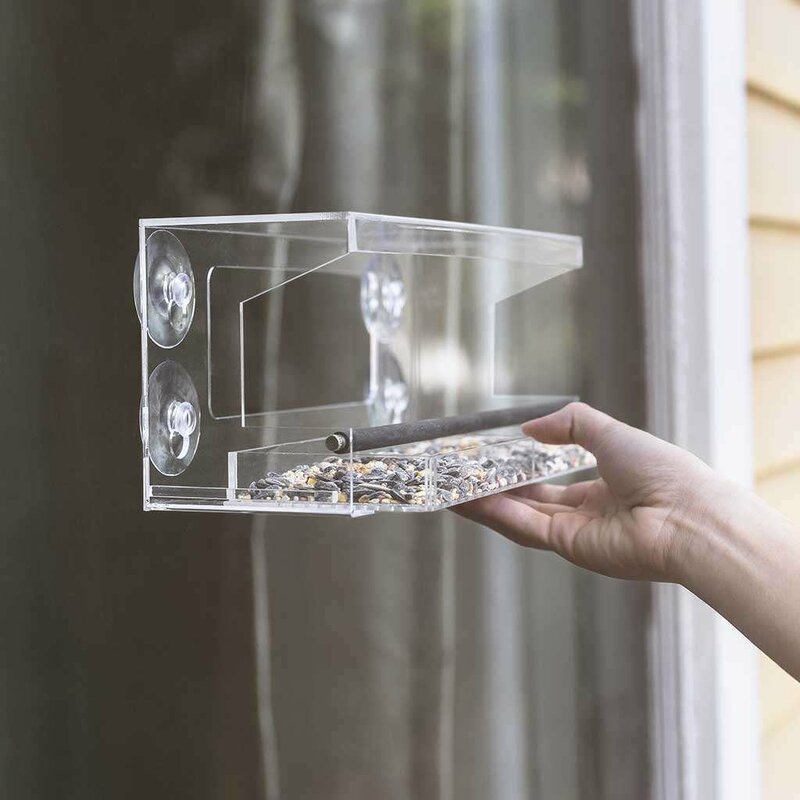 Our sturdy, transparent and build-to-last bird feeder has a removable tray that holds up to 4 cups of seed and a 3" opening that helps keep pesky squirrels out. Simply hang it, and it'll be only a matter of time before your window is the hot new bird hangout. We want you to shop confidently with us. That's why we offer an unmatched satisfaction guarantee and warranty to go with our best-in-class customer service. If you decide for any reason that this feeder is not right for you or it fails in any way, we will refund 100% of your purchase or replace the product with no questions asked. 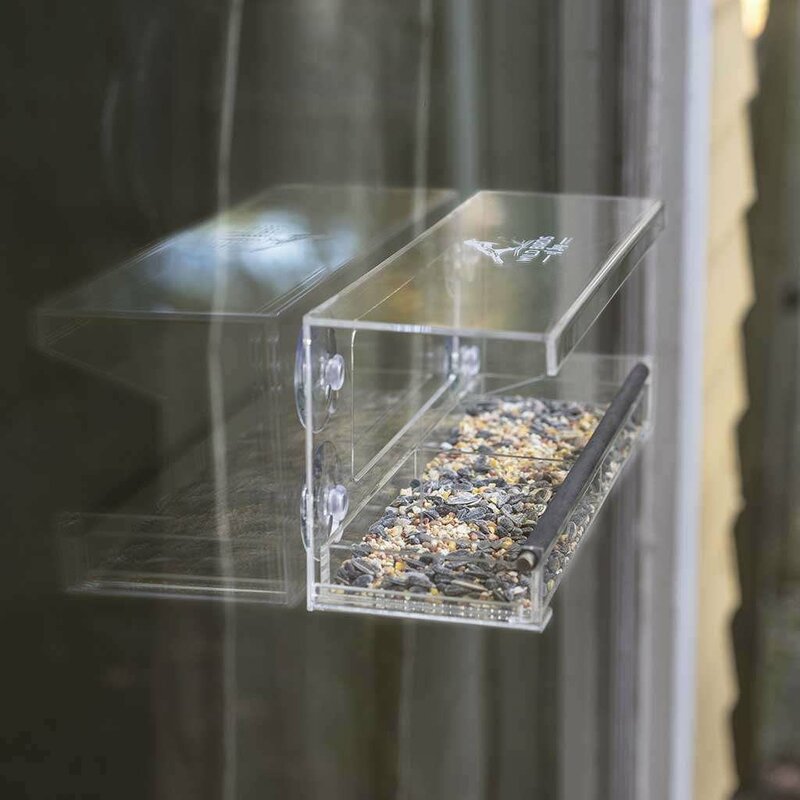 Window Bird Feed by Wild Birds of Joy is a large clear, easy clean, squirrel-proof design with a removable feed tray. 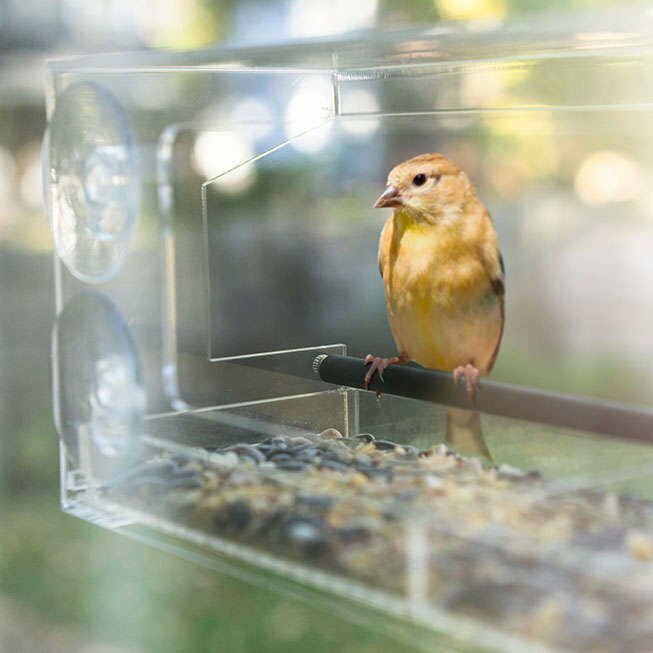 Simply pop the suction cups into the designated slots on the back of the feeder, stick to your favorite window, add up to 4 cups of bird feed to the removable tray and watch the bird come! It’s transparent design give you a front row seat to viewing beautiful birds in vivid detail. 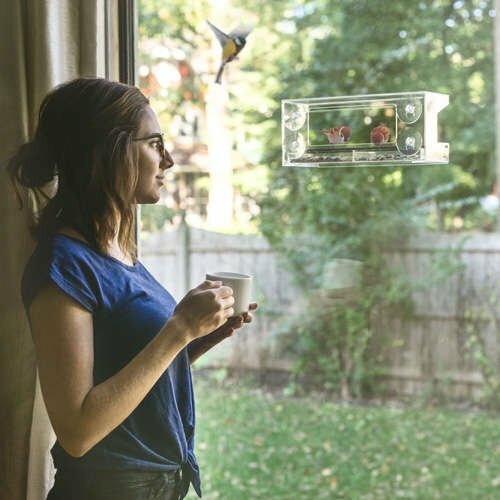 If you love the thought of enjoying the view of the most beautiful birds you neighborhood has to offer, this feeder is for you. With a tray that holds up to 4 cups of seed and a 3" opening that keeps squirrels out, get ready to attract cardinals, blue jays, finches, juncos, chickadees, nuthatches, titmice, sparrows and more to your bird feeder! Where most feeders only come with 3 suction cups with moderate adhesion, this feeder is specially designed to come with four extra strong suction cups to keep it securely affixed to your kitchen window for longer. 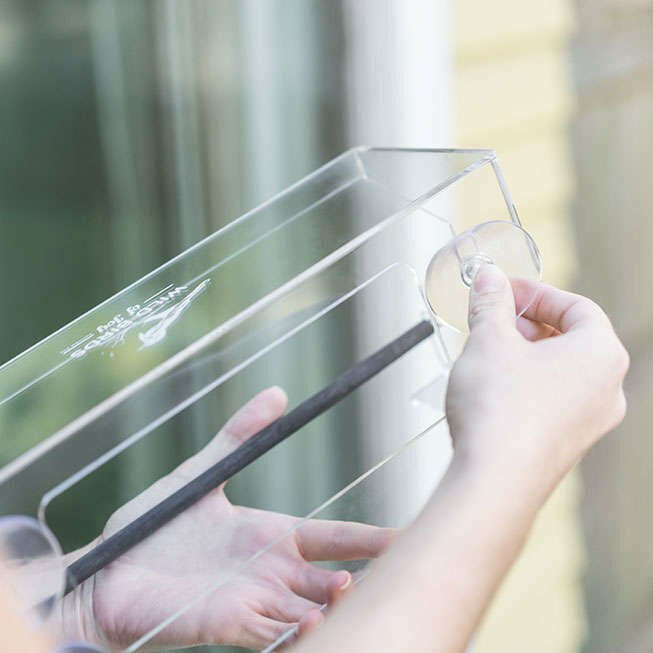 Each feeder is made from only the most heavy duty and shatterproof acrylic so that it can withstand even the harshest weather conditions and the most determined squirrels. Our feeder it built to last so you can enjoy it for many seasons to come. Whether for nature lover, a bird aficionado, curious child or that special someone, this feeder makes for a great gift for the holidays, a birthday, housewarming and more. © 2019 Wild Birds of Joy.